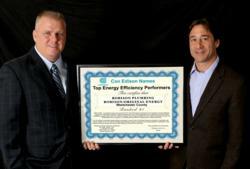 Robison Oil, LLC, the leading heating oil and natural gas provider in greater metropolitan New York, has been named one of Con Edison’s 2011 Top Performing Contractors in energy efficiency for residential customers. In 2011, Robison saved Westchester County homeowners an average of $766,000 through streamlined efficiency programs and services that guarantee customers a consistent supply of energy at competitive prices. Con Edison’s customers are now receiving rebates of up to $1,000 for installing high efficiency heating, ventilation and cooling systems. New Yorkers spend, on average, $2,600 each year on heating, water and electricity. Con Edison works with local heating, cooling and weatherization contractors through the residential energy efficiency program. The program is open to New York State licensed contractors. Participants in the program can save energy and money while helping to protect the environment. Robison Oil has been serving customers in Westchester County for more than 90 years. Robison currently services more than 2,300 homes in in addition to its work in commercial properties. Robison Oil is headquartered at 500 Executive Boulevard, Elmsford, NY, 914-345-5700, http://www.robisonoil.com. Robison Oil, LLC, Westchester's largest full-service oil and natural gas company, has been serving the community since 1921. The Singer family, who has been in the heating oil business in the New York Metropolitan area since 1927, acquired the company in 1980. Robison provides a variety of home services to over 25,000 homes ranging from fuel oil delivery, oil heat service, HVAC service, natural gas supply, natural gas service and electricity and licensed plumbing. Robison also serves commercial and residential customers in New York City through its subsidiary, Original Energy - a division of Robison Oil, LLC. Original is an energy systems consultant and provider of natural gas services. For more information, visit http://www.robisonoil.com.